Boeing has made the first delivery of its new 737 MAX 8, handing one over to an airline with a new name – as can be seen on the side of the plane – which will now become the first carrier to put the 737 MAX into commercial service. The plane was handed over to Batik Air Malaysia, the new name for Malindo Air, at the Seattle Delivery Centre. The Asian airline is still technically named Malindo, which derives from the names Malaysia and Indonesia, signifying a cooperative pact between the two countries. 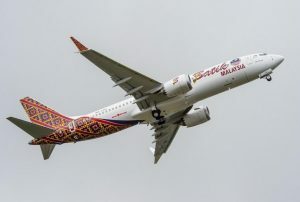 It’s in the process of rebranding to Batik Air Malaysia and the new aircraft provides the first look at the new livery. The airline is 49% owned by Lion Group (which operates the largest privately held airline in Indonesia, Lion Air) with the remaining 51% predominantly held by Chandran Rama Muthy, Batik Air Malaysia’s chief executive. “This airplane will change the face of the single-aisle market,” Boeing Commercial Airplanes president and chief execuitive, Kevin McAllister, declared. Boeing says its 737 MAX family is designed to offer “the greatest flexibility, reliability and efficiency in the single-aisle market”. Every airplane will feature the new Boeing Sky Interior, highlighted by modern sculpted sidewalls and window reveals, LED lighting that enhances the sense of spaciousness and larger pivoting overhead stowage bins. The 737 MAX is the fastest-selling aircraft in Boeing’s history. To date, it has received almost 3700 orders from 87 customers around the world.